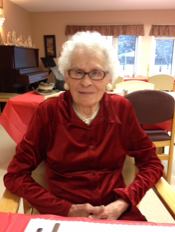 Mrs. Julienne Breault of Edson, beloved wife of the late Mr. Emile Breault, passed away on Sunday, March 24, 2019 at the age of 91 years and 11 months. Julienne will be lovingly remembered by her son Alvin (Kari) Breault, daughters Colette Breault and Diane Drouillard; grandchildren Marc (Marie-Eve) Gaumond, Justin Breault and Ethan Breault; as well as great-granddaughter Emma Gaumond. She is also survived by siblings Theresa (Tom) Sheppard and Nenie Levesque. Besides her husband Emile, Julienne was predeceased by her parents Alexis Duguay and Aurelie Langelier; and sister Gertrude Sergerie. Cremation has been entrusted to Foothills Memorial Chapel – Edson Funeral home. Flowers are gratefully declined. For those who wish, memorial donations may be made to the Parkland Lodge, 4619 – 9 Avenue, Edson, AB T7E 1R7.